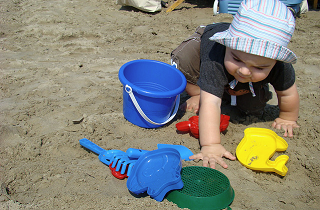 Recycle your 1 liter and 4 liter (quart and gallon) plastic bottles - into sand toys! Clean them out well, and using a craft knife - cut your 4 litre (gallon) bottle all around about 15 cm (6") from the bottom. Poke a couple of holes on opposite sides near the top - attach a short rope handle and you have your sand pail. The remaining piece becomes your funnel. You can cut another 4 litre (gallon) bottle about 5 cm (2") high and poke the bottom full of holes for a sieve. Cut the bottom off your 1 litre (quart) bottle. Then cut a long U-shaped scoop, sloping your cut up along the sides. If your bottle comes with a handle, make sure the handle ends up on the top side of the scoop. This becomes your shovel. 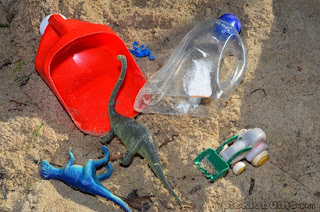 The best part of these toys is - if they get left behind on the beach, you can always make another set!